The Bombay Tiffin Box Suppliers Association, an association of 5,000 lunch deliverymen who are called Dabbawalas (literally tiffin box carriers) in local parlance have finally started their own Web site and a text messaging order taking system that enables them to bag orders real time instead of depending on secondary sources like references or word-of-mouth.The website claims that the Dabbawalas are developing a software to begin accepting orders over the internet. More than 175,000 or 200,000 lunches get moved every day by an estimated 4,500 to 5,000 dabbawalas, all with an extremely small nominal fee and with utmost punctuality. According to a recent survey, there is only one mistake in every 16,000,000 deliveries and the system has registered a Six Sigma performance at 99.999999 rating. The official website of the Dabbawalas is http://www.mydabbawala.com/ recently launched in June 2007. If you are curious and enamored like me over the success of the dabbawalas you can actually spend a day with the dabbawalas in Mumbai. The day involves actually collecting the dabba from the customer, delivering it, having lunch with them and actually taking the empty dabba back to the customer. The procedure is simple as mentioned on their website. 1- Please contact us for the request for the " A Day with Dabbawala". 2- The day may be arranged for single person or a group. 3- You will have to report to our Andheri office or directly at the residence of Dabbawala at about 8AM. 4- If required, we will arrange for a English speaking guide to help you discuss with Dabbawala. 5- You will go with Dabbawala to the customer and collect the Dabba. 6- Then you will travel in local train with Dabbawalas to the destination station. 7- At the destination station , you will do sorting and arranging with Dabbawalas. 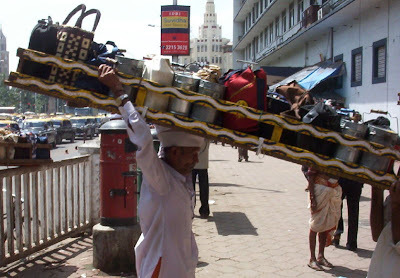 8- Then you actually travel with Dabbawala and deliver the Dabba to customer. 9 - Then you take lunch with the group of dabbawalas. 10- After this the empty Dabbas are collected. 11- The you return back to station with empty Dabbas. 12- Again you travel in local train and reach the starting station. It will be fun this time with Dabbawala in local train as the customer is served and Dabbawalas are relaxed. 13- After reaching destination station the Dabba is returned back to customer and this finishes " A Day with Dabbawala". 14- If required any of the above points may be escaped by you and you may be part of a particular event." The website link to a Day with a Dabbawala appears to be blocked. Is there any other way to contact the program, or has it closed down? While most of the packed meals (Dabbas)originate from homes, Tiffin suppliers also utilise the services of Dabbawalas to deliver meals to their customers. Over 200 Tiffin suppliers are listed in Indiatiffins.com which is a portal for Tiffin services.